Pre-TCR signals induced β-catenin expression is transient and is down-regulated in pre-DP thymocytes. A, Intrathymic signals stabilize β-catenin in DN3 cells and down-regulate the protein post-β-selection during normal development. Sorted ex vivo DN3, pre-DP, and DP thymocytes were analyzed for the abundance of β-catenin protein by Western blot (left panel) and mRNA by real-time PCR (right panel). B, Injection of anti-CD3 Ab into RAG2-deficient mice induces development of DN3 thymocytes to the DN4/pre-DP stage and stabilizes β-catenin. The abundance of β-catenin protein analyzed by Western blot (top panel) and percent DN3 (Lin−CD25+CD44−) and DN4 (Lin−CD25−CD44−) cells in the thymus of RAG2-deficient mice after injection of anti-CD3 Ab (bottom panel) are shown (average of three independent experiments). 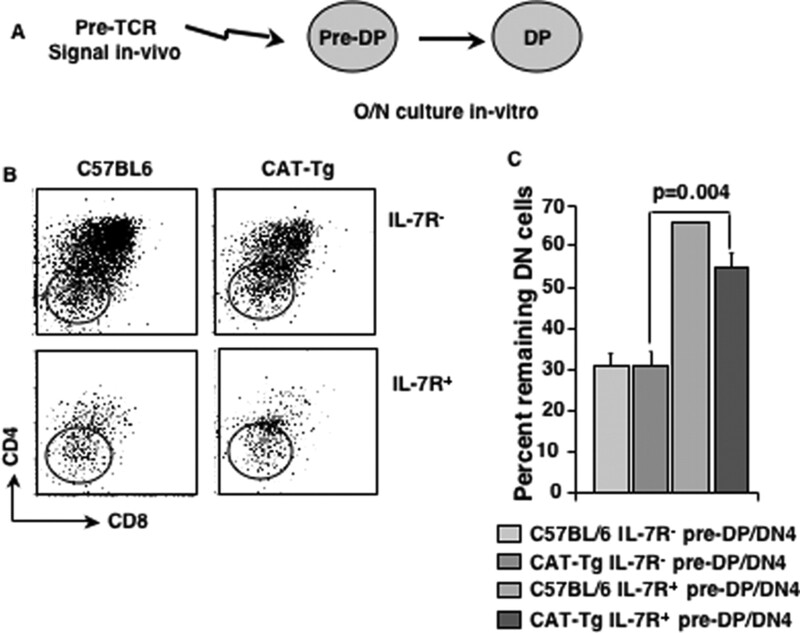 IL-7R+ pre-DP thymocytes develop in CAT-Tg mice in vivo. A, CAT-Tg mice show an increase in post-β-selection thymocytes. 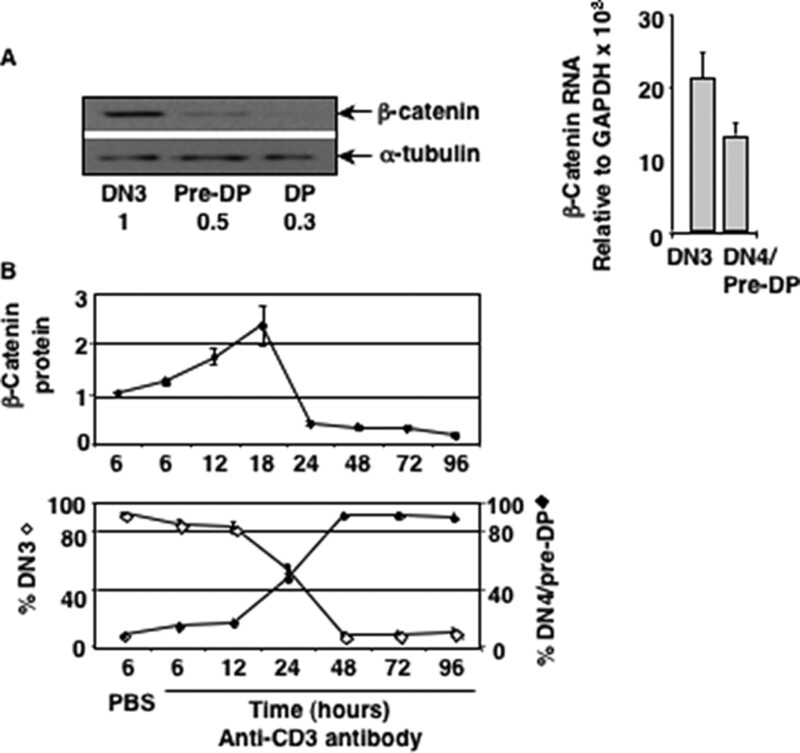 Expression of human β-catenin gene in CAT-Tg thymocytes increases in a graded manner in DN3 and DN4/pre-DP cells. The abundance of human β-catenin mRNA, relative to GAPDH, in sorted DN3 and DN4 thymocytes from C57BL/6 mice and CAT-Tg mice was measured by real-time PCR analysis (left panel). CAT-Tg mice show a relative decrease in DN3 cells and an increase in DN4 cells. A representative dot plot shows distribution of electronically gated Lin− thymocytes into DN3 (Lin−CD25+c-Kit−) and DN4 (Lin−CD25−c-Kit−) compartment from C57BL6 and CAT-Tg mice (right panel). B, Post-β-selection pre-DP thymocytes expressing IL-7R and TCRβIC are found in control and CAT-Tg thymuses. Representative histogram overlays show IL-7R expression on electronically gated DN3 and DN4/pre-DP thymocytes (left panels). IL-7R+ pre-DP thymocytes express TCRβIC (right panels). Data are representative of six independent experiments. 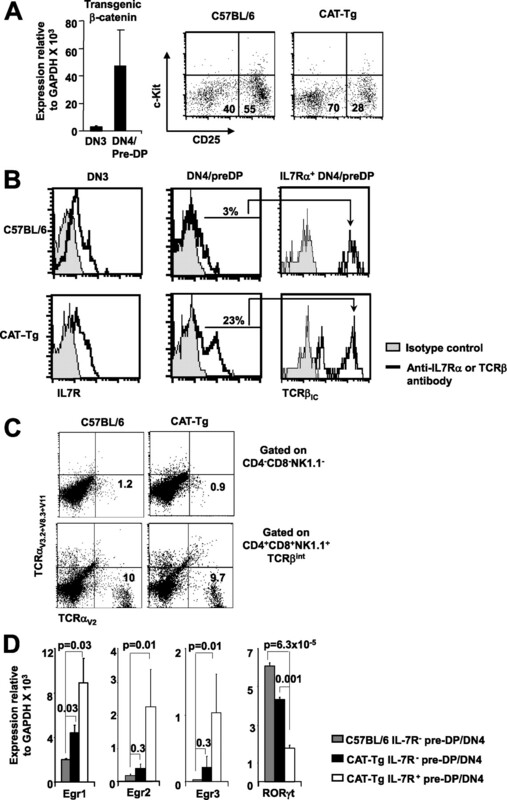 C, CAT-Tg IL-7R+ DN thymocytes do not express TCRα chain. Total thymocytes were stained with a combination of Abs to a collection of Vα proteins along with Abs to CD4, CD8, and NK1.1. Expression of cell surface Vα is shown on gated cell populations. Pre-DP thymocytes are represented in the CD4−CD8−NK1.1− gate (upper panels) and mature thymocytes in the CD4+CD8+NK1.1+ gate (lower panels). D, Ex vivo IL-7R+ pre-DP thymocytes have high abundance of Egr and low levels of RORγt mRNA. mRNA from sorted IL-7R− pre-DP thymocytes from C57BL/6 and CAT-Tg mice and IL-7R+ pre-DP thymocytes from CAT-Tg mice was analyzed by real-time PCR for the abundance of Egr and RORγt mRNA relative to GAPDH. Data are average of three mice of each genotype in a representative experiment. IL-7R+ pre-DP thymocytes develop in RAG2KO-Egr3-Tg mice in vivo. A, IL-7R expression on DN3 thymocytes. IL-7R expression on gated DN3 thymocytes from the various strains. Representative histogram of IL-7R expression on gated DN3 (Lin−CD25+CD44−) thymocytes is shown. 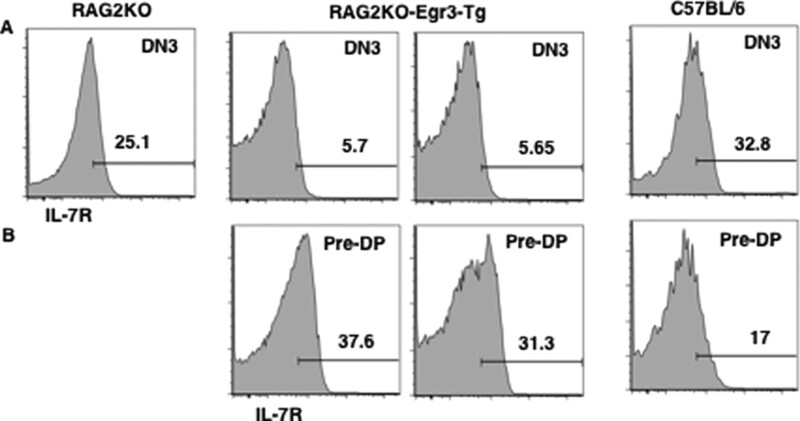 B, RAG2KO-Egr3-Tg mice have increased IL-7R+ pre-DP thymocytes. Representative histogram of IL-7R expression on gated DN4/pre-DP (Lin−CD25−CD44−) thymocytes is shown. Sustained expression of pre-TCR induced β-catenin after traversal through β-selection checkpoint blocks T cell development in vivo. A, The frequency of IL-7R+ DN thymocytes is increased in CAT-Tg mice in vivo. Thymocytes from C57BL/6 (n = 17) and CAT-Tg (n = 19) thymuses were stained with Abs to CD4 and CD8. Percent DN thymocytes are plotted (left panel). Representative plots of CAT-Tg and control thymocytes stained with Abs to CD4, CD8, and IL-7R are shown (right panels). 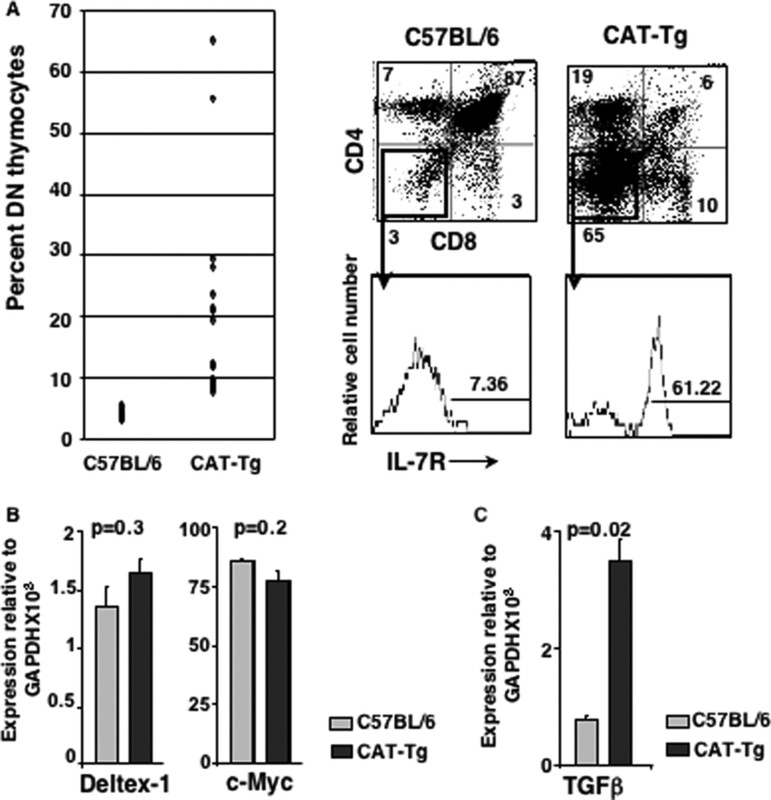 B, Notch signaling and c-Myc expression is comparable in CAT-Tg and C57BL/6 DN thymocytes. RNA from CAT-Tg and control thymocytes was assayed by real-time PCR for the expression of c-Myc and Notch target gene Deltex-1. C, Ex vivo CAT-Tg DN thymocytes express high level of TGFβ mRNA compared with the wild-type thymocytes. RNA from CAT-Tg and control thymocytes was assayed by real time PCR for the expression of TGFβ. IL-7R+ pre-DP thymocytes are impaired in maturation to the DP stage. A, Schematic of experimental design to determine the developmental potential of sorted pre-DP thymocytes in vitro. B, IL-7R+ pre-DP thymocytes fail to mature to the DP stage. Sorted IL-7R+ and IL-7R− pre-DP cells from both C57BL/6 and CAT-Tg mice were cultured in vitro for 20–24 h. Representative dot plots show expression of CD4 and CD8 following in vitro culture. C, Statistically significant number of IL-7R+ pre-DP cells fail to mature to the DP stage. Quantification of the fraction of cells that remain DN after culture in B. Data in the graph are average of three mice of each genotype in a representative experiment.